Doncaster Phoenix have appointed Adam Kettle as head coach and added Michael Hills and Declan Cusack to their new-look coaching set-up. Kettle steps up from his previous position as forwards coach to replace Anthony Posa who has taken over at Bradford & Bingley. He will continue to combine his coaching role with playing for the Castle Park side. Last season Phoenix finished sixth in the Midlands Premier Division and reached the Yorkshire Cup final for the first time. Kettle said “Even though the season has only just finished, I’m already looking forward to getting stuck into pre-season. Having worked with the boys for the last four years, I know the potential that this young squad has. 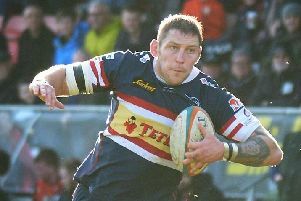 Current Doncaster Knights captain Hills will take up the position of forwards coach. Local lad Hills has a long association with Doncaster rugby, having played throughout the junior ranks and captaining the Knights for the last five years. Phoenix’s new backs coach Cusack has signed up as a player coach ahead of the new season. The fly-half joins Phoenix after three seasons at Knights where he made 64 appearances and scored over 250 points. The Irishman, who started his career playing alongside the likes of Paul O’Connell, Conor Murray and Ronan O’Gara at Munster, should make a big impact both on and off the field for his new club. Club chairman Scott Plevey added “The club would like to thank Anthony Posa for the hard work he has put in over the last four years, a period which has seen unprecedented success for the club with two promotions and several of our young players making appearances for the Knights. First team captain Sam Bottomley stays in his role as strength & conditioning coach, whilst Tim Elliot and Noel Hayden will continue in their roles coaching and managing the second team following their success in winning the South Yorkshire Cup last season. Phoenix regularly field three senior teams and welcome players of all ages and abilities. If you are interested in joining the club then contact director of playing Dave Thomas on 07828 204734 for more information on pre-season training.